Before I begin the long awaited hacking portion of this feature, Id like to take some time out to express my gratitude to fellow hacker MarkGrass. As most of you know Mark has been a long time member of the Bioflames forums and has found many new and interesting discoveries on the discs of various Resident Evil's. He is one of the communities greatest assets right now and it is with his help that this portion of the feature will really shine, so please be sure to thank Mark. With that done Id like to go into brief detail of what this feature will attempt to cover. Using a method that hit both Mark and I during our discussions, We are able to activate the debug menu in various builds of Resident Evil 4 / Biohazard 4. I wont go into detail as to how to do this, as Mark and I would like to keep it under wraps currently since a good portion of blood sweat and tears went into getting it all working 100%. There are also possible negative effects that would happen in the community which would result if this method would be released.  I cannot go into detail there either however there are plans to release the method but we would like to get a comprehensive list together first of what everything does. 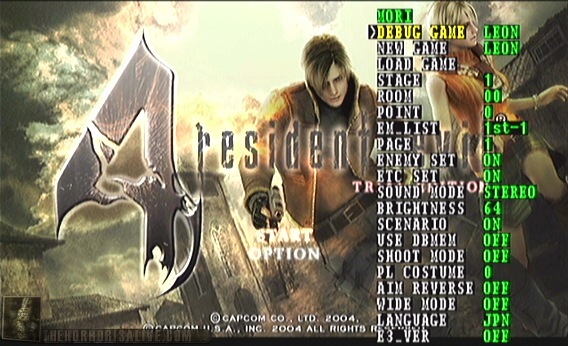 So with that, I am booting up my copy of Resident Evil 4 Trial Edition (GCN) with the debug menu active! As you can see there are quite a few options available right from the main menu. Its also worth noting that the game skips directly to the main menu with the debug menu active. If you press the Z button the menu disappears, allowing you an unobstructed view of the main menu image. Moving your C Stick around moves the Debug Menu around the screen. Below I will start documenting all these options as seen above in an easy to understand format. Mori is simply the name of a map you are about to load. Presumably this is in Ramanji (Japanese text using Roman characters). This option changes depending on what you set the STAGE, ROOM, and POINT options to. Using this option allows you to start a "Debug Game" with the character of your choosing. You can adjust the Character with your thumbstick or D-Pad doing so adjusts both the DEBUG GAME paramater as well as the NEW GAME parameter. The options are LEON, ASHLEY, ADA, LEON + ASHLEY. Its worth saying that the game will NOT boot unless only Leon is selected, presumably because none of the other characters models are present on this disc. This option is the same as above essentially except it starts a "NEW GAME". This however doesn't work in this version, and crashes the game. This option is where things get interesting, It has four options. 0,1,2, and 3. You can think of STAGE as a folder. Specifically there are four folders which all house different maps in the game. St0 covers beta and test rooms. Some rooms in this category are obviously from the Biohazard 3.5 build however none of the St0 maps will load, as they are not present on the disc. St1 covers the begining of the game and the various Village areas. St2 covers the Castle area and finally St3 covers the island maps up to the final battle. We will go in depth with this once I explain the other options which rely on it below. Room works in conjunction with STAGE. It has various settings depending on what STAGE is selected. Think of ROOM as a map selector. It will load a specific map from a specified folder (STAGE). Point essentially allows you to jump to various locations in a map (ROOM). Usually its option is either 0 (default spawn point) or 1 (somewhere further in the map). As stated, STAGE, ROOM and POINT all work together. So with that in mind I am displaying a full list of the available options from these settings on the next few pages.